In my book, fishing and music go together like blue crabs and Old Bay seasoning. It’s hard for me to imagine one without the other. I’ve been singing, playing, and writing music for as long as I’ve been fishing. 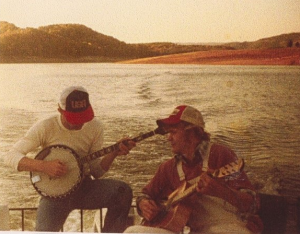 Here’s a shot of me with my best friend Curtis Seals from back around 1979 picking and grinning on the deck of the houseboat I called home. You can’t tell it, but Curtis is steering the outboard with his left foot while he picks his banjo. That takes talent! Many of the songs I’ve penned relate to the water in one way or another. My songwriting has slowed in the past few years because, in my opinion, a good song needs a firm sense of place. After moving away from my home in the Appalachian Mountains to this Chesapeake Bay country, I needed to thoroughly steep myself in the culture before trying to translate local images into songs. A few verses have been showing up in my head lately though, and my old Martin D-18 guitar is coming off the stand a little more frequently than it used to. My son Daniel has a gift for immediately capturing the spirit of the places he visits. He recently turned out a chilling ballad about the ghost of a barge captain who haunts the waters around Cape Charles, Virginia. I’m excited about the song because it’s laced with images of hurricanes, lighthouses, oyster bars, diving gannets, and blitzing rockfish. I hope he’ll record it soon. All three of my sons are excellent musicians. Cory and Daniel recently released an album with their band Mountain Soul that features several original songs. While there aren’t any Chesapeake songs on the CD, there are plenty of references to fishing, including a re-make of my original song Trotline – a true story about a Tennessee valley waterman who catches catfish from the lake that flooded his family farm. You can check out the boys’ tunes on their website, mountainsoul.net. If you like them, you can download the entire album from this link at Amazon.com. Just drop me a line if you want a hard-copy of the CD, and I’ll tell you how you can get one though the mail. I’ve been away for most of August. During that time, I got to play music with some friends in Michigan and my family in Tennessee. I’m back on the Bay now and ready to sing the praises of what promises to be a good late summer/early fall fishing season. My boat Thunder Road didn’t sit idle while I was away. She spent the time with Jim, John, and Lance at BOE Marine where she got some much needed upgrades to her electronics. 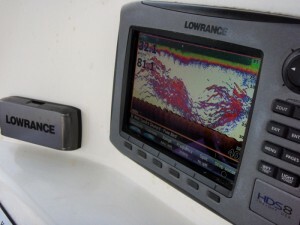 One of the gadgets they added is the Lowrance SonicHub music player. The system interfaces with my existing HDS sonar/GPS/Structurescan combo. I just slide my Ipod into a water-tight compartment, and use the controls on the unit to select the songs I want to hear. The name of the song, album, and artist appears in a small bar at the bottom of the screen. That’s pretty cool, huh? I tried it out this weekend when my sister-in-law Judy and her friend Karen visited from California. They like to fish, so I took them out on the Bay soon after their plane landed. We had a fun weekend that included trips to several docksid e restaurants and bars, and, of course, plenty of fishing. We didn’t have but an hour of daylight Thursday, so we stayed close to home in Eastern Bay where we found several pods of breakers. It’s time for Spanish mackerel to migrate into our part of the Bay, so we spent the better part Friday evening looking for them. 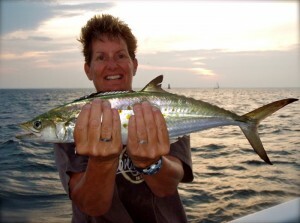 We caught a few east of Tighlman Island along with plenty of keeper rockfish and bluefish. 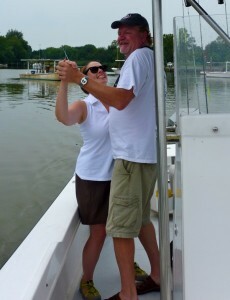 Saturday brought a cruise to Baltimore’s Inner Harbor, but we managed to hit a few Upper Bay hotspots on the way back. 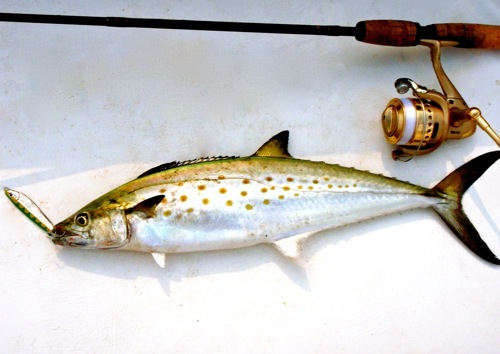 It stormed most of the day Sunday, but the skies cleared about 6:00 PM, just in time for some successful Spanish mackerel casting south of Matapeake. Casting for Spanish is great fun. While the fish are prolific in other parts of the country, we get them for only a few weeks here in the Chesapeake. If you’re interested in learning more about how to cast for them, check out this article I wrote this time last year. It’s just as pertinent today because there are plenty of fish now in the same area they were in then. It even features the same cast of characters. There are a lot of Spanish close to Kent Island this year. I don’t know if that means there are more fish, of if they just found their way north a little earlier than usual. We found a big school before dark last night about a mile from the Matapeake ramp. I’ll enjoy my new stereo system, but not while I’m fishing. My style of casting requires stealth and quiet. After our successful evening Sunday night, I couldn’t resist roaring back up the Bay with Aerosmith cranked to the max. Steven Tyler voiced my emotions exactly. It’s good to be back in the saddle again. Look for Spanish in all the same places where you find blitzing stripers and blues. If the current is running, you’ll see them gracefully arching above the breaking fish. It’s good to keep an eye out for isolated pods of working terns now as well. Two weeks ago they weren’t worth a second look, but things have changed. Like the macks, terns are faster than other species, so they can outrun the seagulls to schools that contain mostly Spanish. 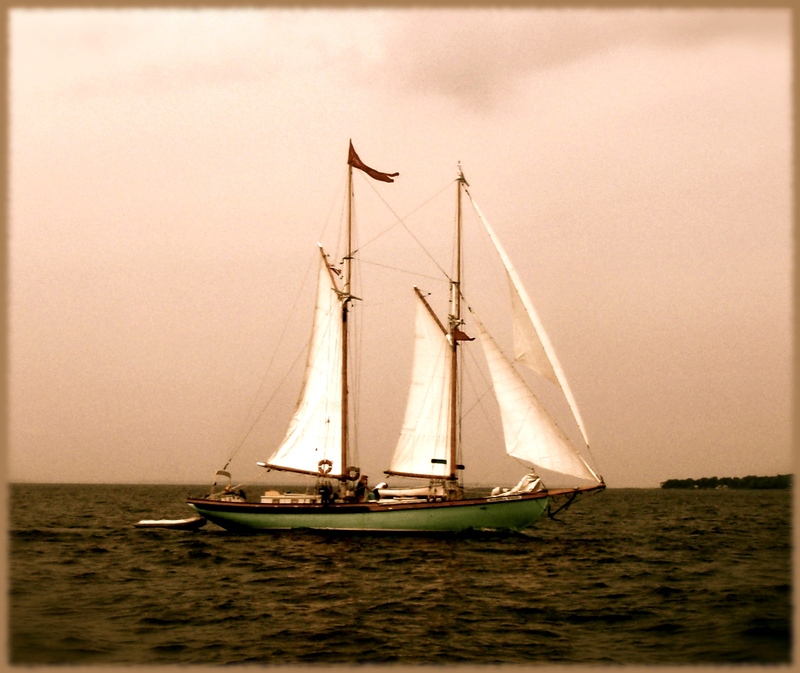 I’ll sign off with a photo of the classic blue nose schooner Martha White, which I spotted rounding Kent Point Saturday afternoon. I wasn’t surprised to learn her owners are bluegrass fans. Beneath the photo are some lines to a song I recently wrote about another maritime encounter that took place a little farther south. Songs without music can leave a lot to the imagination, but since I hope a good lyric will hold up as poetry, I’ll let this one ride the waves for a while. Copyright © 2011 Shawn Kimbro & Trailzzone Publishing, BMI. All rights reserved. Good read, Shawn. 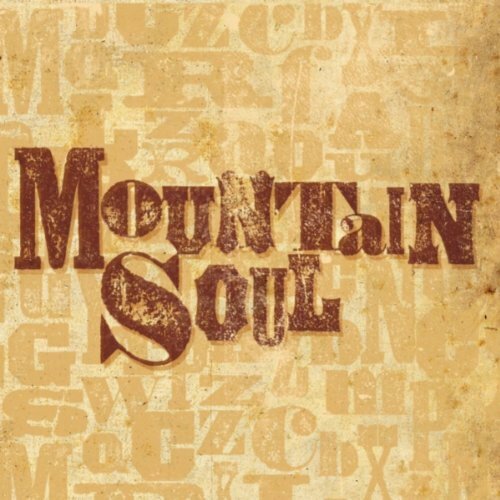 I’m going to order a Mountain Soul CD. I think Glass Heart reads well as either a salute to an escaped enemy or a tribute to a lost love. Thanks for sharing. Love it all – the photos, the music, the fish, and the song. Great article and great observation of tie-in between music and fishing. I feel like you’ve written this article for me personally. 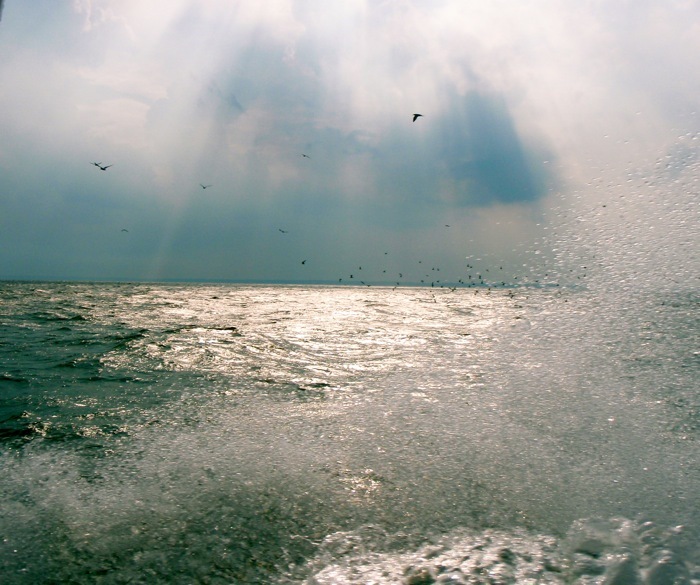 Fishing, like music, follows rhythms, and the time signature of the bay is the rhythmic rise and fall of the tides and the associated currents. In fishing, you literally need to come in on the right beat to be successful. Oh man this is great timing! I’ll listen to these songs on the way down to see Prine tonight. I’m pullin my camper down to northern Va. and stayin at a campground close to Wolftrap. Was stayin til Sunday but Irene is changin my mind. That said I hope you get to see Prine on Saturday but I’m skeptical. Now I’m glad I got the Friday show. Prine has a couple of fishin songs which I enjoy. Steve Martin’s gettin a good bit of play on his Yellow Back Fly song. Music and fishin-hard to beat. Well, maybe add good beer! Great pics and read. Thanks for sharing with us. Just one of my favorite pictures of you and Curtis. Enjoyed the article and I’m happy to see you found a way to bring your music with you. I’ll now have this wonderful picture in my mind of you and Dianne dancing on deck. I’ve also enjoyed the Mountain Soul cd, the boys did do a good job with it. “Music, whiskey, and fishing poles. That’s really all you need in life” and I have to add the love of a good woman. Don’t you bother me about anything today. I don’t care what you do and I don’t care what you say. I’m goin fishin’, fishin’ on Chesapeake Bay. Whatever you need from me is gonna have to wait. I’m gonna catch me some fish, oh baby! I’m goin fishin’!, fishin’ on Chesapeake Bay. Makin up stories ’bout the ones that got away. When I go fishin’, fishin’ on Chesapeake Bay. Don’t want no fussin’, dont want no fightin’. to go fishin’, fishin’ on Chesapeake Bay. When I start to fishin’, I just can’t stop. It’s surely gonna’ make my day. Get a little rest, wake-up and do some crabbin’, Oh baby! Baby I’m goin fishin’!, fishin’ on Chesapeake Bay. Hook line n sinker baby!! Rod Reel and tackle! !